Hello fellow quilt lovers! My name is Amy Smart. I learned to quilt from my mom when I was growing up, but have been doing it in earnest since the birth of my first baby 17 years ago. I love share my quilting obsession including patterns and tutorials at my site, Diary of a Quilter and recently published a book, Fabulously Fast Quilts. 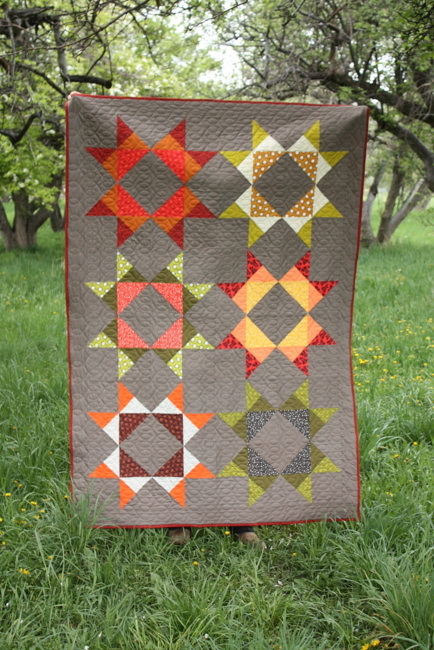 I have been a big fan of Missouri Star Quilt Company and was so excited when they invited me to do an MSQC Tutorial Reboot! Serendipitously, my family had a trip planned to Missouri for Spring Break a few weeks ago and I got to visit Hamilton and the whole Missouri Star Quilt Company extravaganza! 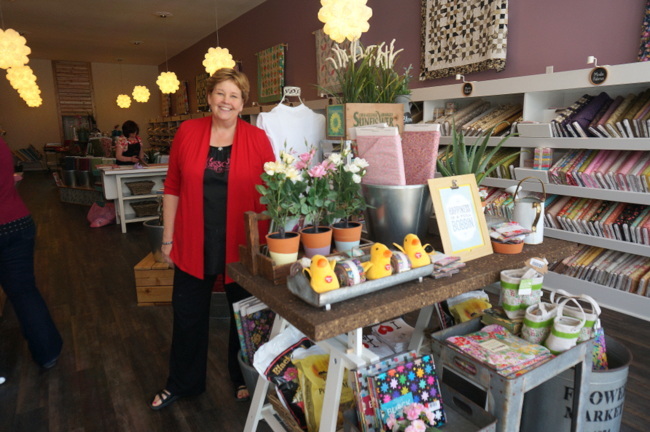 You can read more about my adventures in Hamilton in this post, including an amazing grand tour of all the shops by Jenny herself! 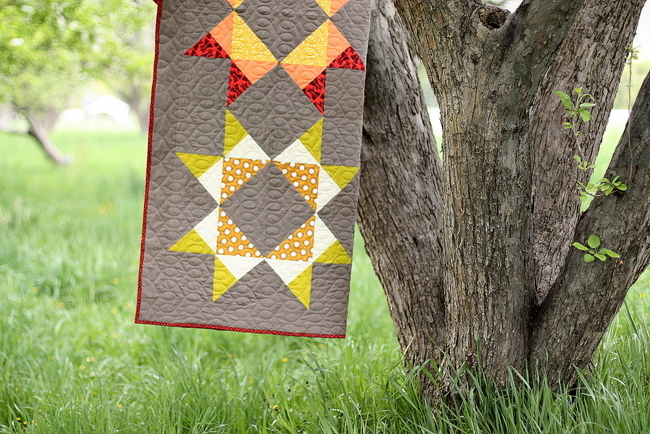 As I looked through the myriad of quilting videos and tutorials from MSQC over the past years, the one I was most excited to make myself was the classic Missouri Star block itself. (Seems appropriate.) I’m a sucker for large quilt blocks, especially stars, and I loved the scale of Jenny’s block. 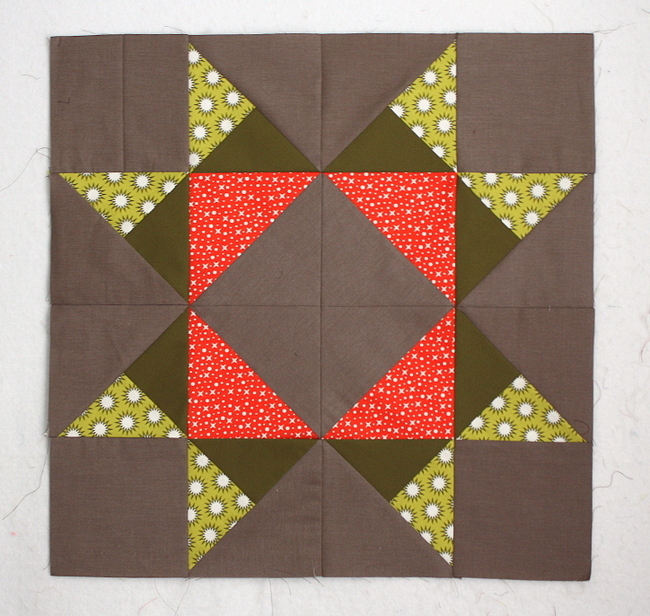 I’m also a big fan of short cuts and quick piecing and I loved Jenny’s method for creating this block quickly using pre-cut 10″ x 10″ squares. The large scale of the block lends itself so well to a modern, graphic design. I thought I’d pair a darker, woven solid with some bright, modern prints to change the look a little bit. 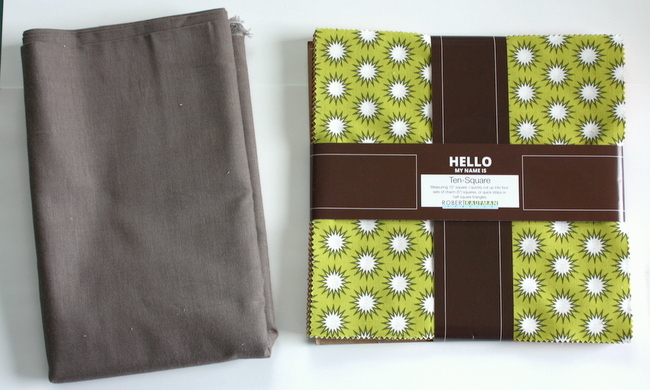 I used Peppered Cotton from Studio E in True Taupe as my background (I love the subtle, homespun texture that comes from a woven) paired with a 10″ x 10″ set of precuts from Elizabeth Hartman’s Warm Pacific collection. Each block requires 3 10″ x 10″ squares. 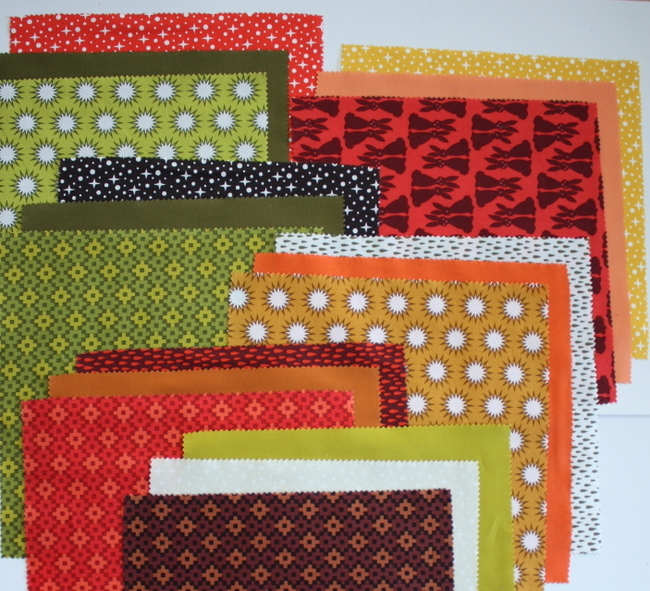 So before doing any cutting or piecing, I mixed and matched my 10″ precut squares into 6 sets of contrasting or complementing prints and colors. That way I knew I was getting a nice variety of colors, prints, and combinations. From there I assembly-lined cutting and piecing my blocks. One thing that really helped were these custom rulers from MSQC – they come in 2 1/2″ x 8″ and 5″ x 15″ sizes. 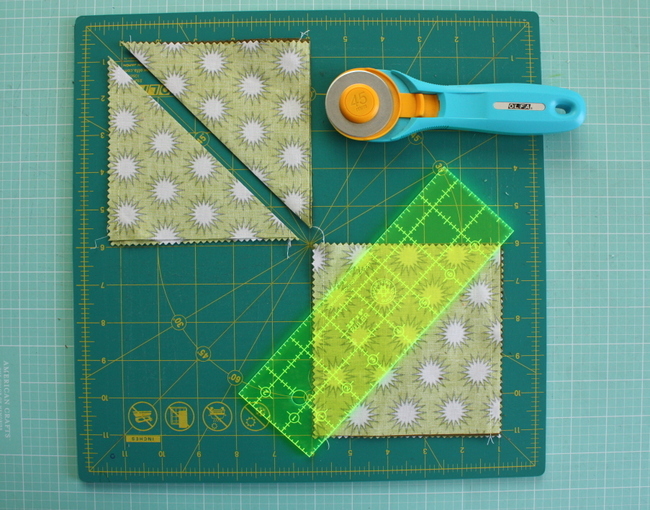 They are PERFECT for working with precuts – especially cutting those pre-cut 5″ and 10″ squares on the diagonal, without having to get out a bigger ruler. 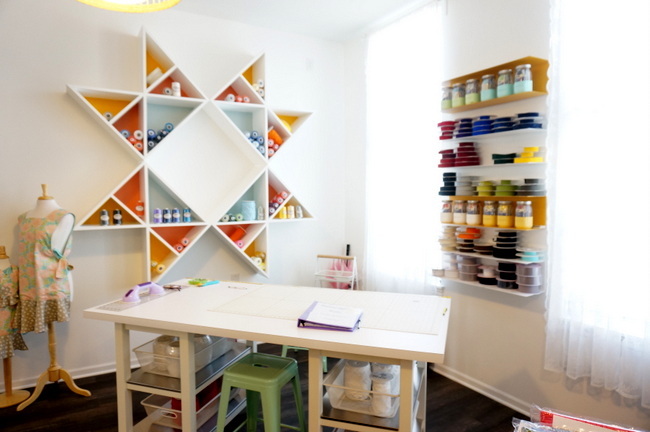 You can follow along by watching Jenny’s tutorial! I was originally going to make just a wall size quilt using 4 quilt blocks, but I liked the fabric and the block so much, I added two more blocks for a lap-size quilt. (My quilt finished at 52″ x 75″.) I think I would have kept making more blocks if I’d had more fabric on hand! I definitely want to make this pattern again – the blocks come together SO quickly – and because the scale of the finished blocks is 23″ x 23″ so you don’t need to make a lot of them. It would be a quick way to make a large bed quilt. In the meantime, I’m claiming this quilt as my snuggle quilt to carry around to soccer games, picnics, and Sunday afternoon naps. The bold colors make a statement, but the warm, taupe background will hopefully hide some of the evidence of everyday use. Here’s one more parting shot of the giant Missouri Star in the MSQC trims shop. Appropriate, don’t you think? Thanks so much for having me Missouri Star! It was a blast to visit in person, and I’m so excited to have my Missouri Star Quilt as a reminder.